When businesses and charities partner together, everyone wins. The company gains goodwill. The charity gains exposure and income. Large corporations often have matching gift programs, doubling the donations their employees make. Volunteer grant programs couple valuable resources: employees give of their time while the company provides funding to the charity of choice. Apple, Google, Expedia and Pepsi are excellent examples of philanthropic corporations. But those are large-scale companies with large-scale capacity. What about small, local businesses? How can they make a difference? The following five examples all come from real-life partnerships between local companies and the Union Gospel Mission (that’s where I work, so hey, that’s what I know), but with a few twists and a little tweaking, they could be made to work for a wide variety of worthy charities. Crazy Campout – Turn a drive into an event. Every year, UGM puts on a City-Wide Thanksgiving Dinner for homeless individuals and low-income families. We love to give out warm clothing items – thick socks, gloves, hats and scarves – but we don’t always have enough to meet the needs of our 1,000 plus guests. This year, 16 Cents, 3 Shoes & 5 Socks, a local furniture store, stepped up to help, holding a weekend campout in the parking lot of one of their stores. Thanks to lots of Facebook Live, they collected more than 1,500 pairs of socks and 252 pairs of gloves during the #CrazyCampout. Good publicity for the business. Lots of needed items for UGM. Charity Auction – Every year, at their anniversary event, Dealers Auto Auction holds a charity auction to raise money for four local charities. They showcase their auctioneers’ amazing talent by auctioning items with a low cost to DAA but high value to their fellow dealers – choice of lane, date and time for an auction; front row parking for the Thursday auction all year long; a moose dinner featuring moose shot by owner Bob McConkey. Fun event for DAA. Valuable funding for UGM. Sponsorship Combined with Volunteering – Larry H Miller Dealerships have underwritten UGM’s City-Wide Thanksgiving Dinner for the past three years. The general managers and their spouses, along with other staff members, also come to serve the meal. UGM benefits both from the team’s enthusiasm and their underwriting support. At the same time, managers and their families bond over a hands-on volunteer experience to a group of people who are generally very grateful. Donate your leftovers. OK, that sounds bad, but in many cases, your leftovers have real value. If your company does regular computer upgrades, chances are your old computers might be better than what’s sitting on the desks at your average non-profit. A local screen-printer recently brought UGM a bunch of t-shirt misprints. The logo was wrong, but they still had excellent value as clothing. Brent Christian from Tobler Marina in Hayden, Idaho donates boats he has taken as trade-ins but doesn’t plan to sell to UGM Motors. Employment Opportunities. Part of what UGM does is help people get back on their feet after periods of unemployment, and one of the ways businesses help us do that is by providing business practicum experiences. Participants in our long-term recovery programs do 240 hours of volunteer work at a local business. The business gives the individual valuable work experience and a possible reference while receiving 20 hours a week from a conscientious worker. 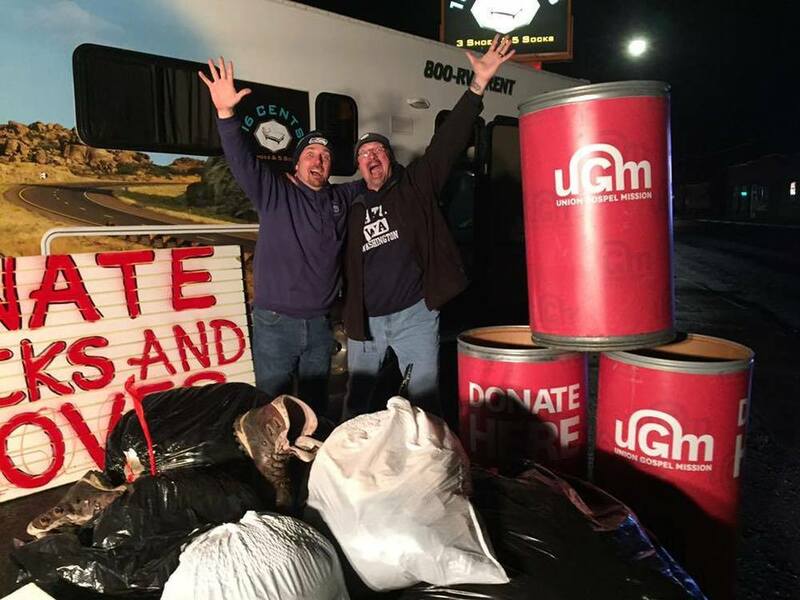 Of course, in each of these cases, UGM seeks to return value to the business for their generosity – showing up in person to thanks, signage at events, posting photos and shout-outs on social media, features in the newsletter – but the real value is so much bigger than the marketing and publicity. Business and charities working together make the community a better place to live, and that’s a benefit all of its own.